This sculpture is near the intersection of 4th and Marble in Albuquerque. It is one of a series of identical monuments placed in the 12 states through which the National Old Trails Highway passed. 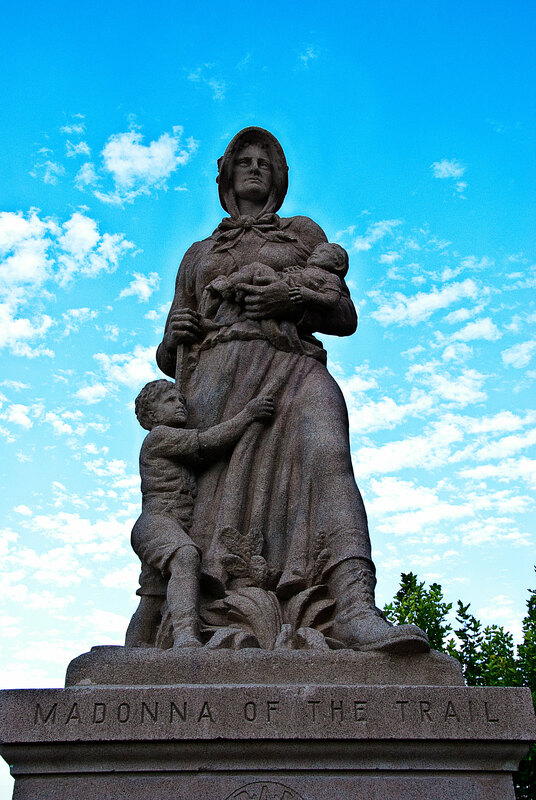 The monuments were intended to memorialize the contributions of pioneer women in settling the American West. The speaker at the 1928 dedication of the Albuquerque sculpture was Harry S. Truman (later, U.S. president), who at the time was a county judge in Missouri. All the monuments were sculpted by August Leimbach. For decades, Albuquerque’s Madonna of the Trail was ensconced in a pretty neighborhood park; unfortunately the park was destroyed around the sculpture to make way for a public building–an architectural monstrosity of which Albert Speer would have been proud. The sculpture is sadly diminished by such surroundings.